This quinoa bowl is a protein-rich way to start the day! Flavored with baked apples and our CBD Superfood x Goddess Ghee CBD Golden Spiced Ghee, it is also a nourishing way to begin your day with anti-inflammatory foods. Rainy weather can trigger inflammation in the body, so a heaping golden Spiced breakfast bowl offers good balance against the potential bodily effects of a wet climate. Let us know how much you enjoy it! Dice apple and sprinkle with cinnamon and 1 tbsp honey. Bake for 10–15 minutes until apples are soft. Combine quinoa, honey, and CBD Golden Spiced Ghee in a bowl. Mix until all quinoa is coated. 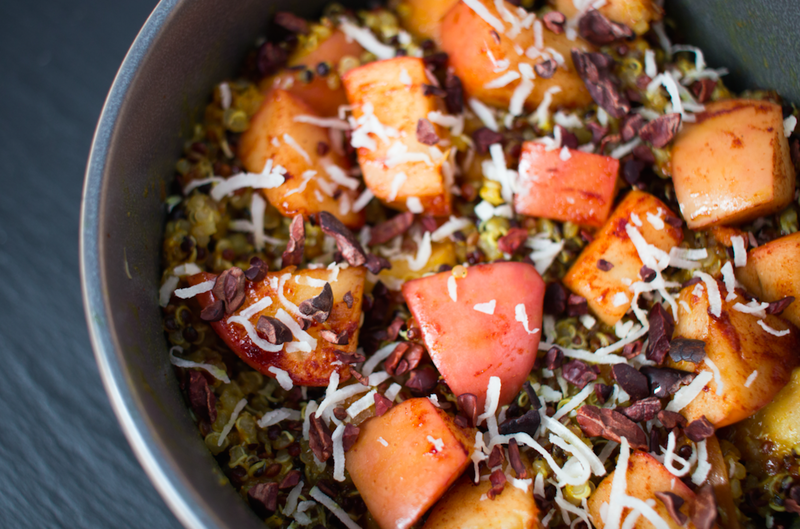 Top with apples, shredded coconut, and cacao nibs and enjoy!